In 1932, Louis McGlaughlin launched what would become the gas barbecue industry by starting the Chicago Combustion Company. During those early years, Louis focused on building gas burners for commercial and industrial applications. The most famous of those burners was the ARGIL. Soon he found that his burners were being adopted for commercial cooking. After moving to New York, Louis incorporated new ideas and improved on his burner by building our first successful gas-fired broiler called the BROILBURGER. The 1939 World’s Fair in New York City marked the start of the gas-fired barbecue business known today as LazyMan. 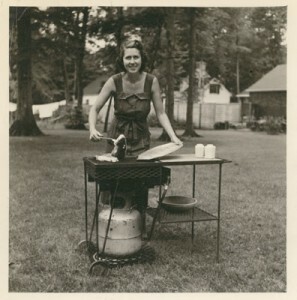 The BROILBURGER was the centerpiece of our booth at the fair and later sold to restaurants that wanted the flavor of charcoal cooking but with the ease of gas. BROILBURGER pioneered many unique features for the day such as sealed burners, automatic rotating forks, and a precursor to ceramic fire bricks and gas ignited charcoal briquets. They were quickly adopted by luncheonettes, sandwich shops and other restaurants. While these first units were fired by Henry Ford’s Ford Charcoal Briquets, they later were adapted for full gas operation, replacing the briquets with lava rocks. In the 1940’s, with the combination of the ARGIL burner, a high quality utility stove was introduced. This evolution started us down the path to the barbecue business. Until the mid-1950’s, the gas grill business was almost exclusively found in commercial cooking. The first ever portable gas grills were sold in 1954 by Chicago Combustion Corporation. Shortly after, two other companies, Charmglo and Falcon, released competing portable grills. Based on the premise of the successful gas fired BROILBURGER, these portable gas fired barbecues featured state of the art burners. The burners were built from the lineage of burner technology that formed the basis of the Chicago Combustion Company.Other early design ideas included porcelain on steel fire boxes, electric rotisseries, and lava rocks to emulate the charcoal flavor. Don McGlaughlin, Louis’ son needed a source of fuel for their new portable grill. The iconic propane bottle that we now associate with the grilling today was actually sourced from the 20-lb propane cylinders used by plumbers. In 1959 you could purchase our portable Model AP for $131.25. Chicago Combusion saw the first huge growth nationally for the residential gas grill in 1959. 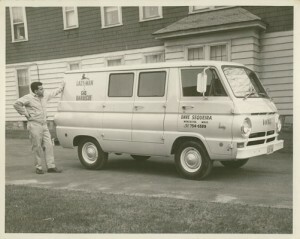 In 1960, the company started to wholesale permanent natural gas grills to the New Jersey Natural Gas Company. For $1 a month added to your gas bill for 39 months, the company installed the grill for you. To this day, LazyMan still offers propane or natural gas in the same basic design which can be purchased in either portable or permanent versions. Over the next 30 years, Chicago Combustion continued to develop new models such as the Masterpiece Series which is a more “traditional” gas grill. We slowly exited the mass retail business in favor of selling handcrafted gourmet grills by our network of distributors who offer high touch sales, service and support. With this evolution, we decided it was time to rebrand the company and became LazyMan. LazyMan comes from our earliest grill line whose name was inspired by how much easier gas grilling was compared the charcoal of the time. What sets LazyMan apart from other companies is our attention to quality and durability. Our parts are made from the absolute highest quality materials. All of our stainless steel burners, fireboxes, grates, hoods, shelves, and drip pans are made in our factory in Belvidere, New Jersey. The handmade quality craftsmanship is apparent from the first day you receive your product to every time you use your grill for the next 40 years. We are extremely proud to say that we stand behind every single grill we have ever made. To this day, more than 80 years since we were founded, we sell replacement parts for every product we have ever made.